Creation: Appeared in July 1933 as a renumbering of VA 37 from Westland to Winchester via Irvington, Kilmarnock, Warsaw, Fredericksburg, Culpeper, Sperryville, Washington, and Front Royal; replaced VA 827 from Winchester north to West Virginia via White Hall. This is the 2nd VA 3. Adjustments: In Dec 1937 (CTB), VA 3 was removed from the SR 659 loop at Flat Iron. In Sept 1939 (CTB), VA 3 was placed on its current direct routing between Lively and Lancaster, leaving behind VA 201 (now includes VA 201Y) and SR 600. Also in 1940, VA 3 was rebuilt to use today's modern US 522 in Culpeper County north of Culpeper leaving behind SR 695/707 Boston and many abandoned alignments. In October 1940 (CTB), VA 3 west was truncated to end at US 211 Sperryville. It is possible VA 3 ended at the north end of today's SR 1001 at US 211, replacing a presumed VA 3Y. Sperryville to Winchester became VA 522 (now US 522) and Winchester to West Virginia became VA 261 (now SR 739 north of VA 37 and abandoned alignment south of the freeway). About 1941, VA 3 was placed on new bridges over the N and S forks of the Shenandoah River, leaving behind part of SR 637; Old Winchester Pike in Riverton: N. Royal Ave in Front Royal. About 1947, VA 3 west was truncated to its present Culpeper end, leaving behind its US 522 duplex. In Dec 1947 (CTB), VA 3 was removed from Old Fredericksburg Rd in Culpeper. 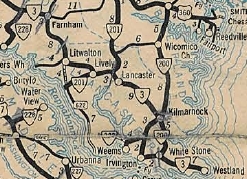 About 1950, VA 3 was rerouted in northern Lancaster County to new alignment (referred to as VA 3 ALT in CTB). This left behind SR 622 to Nuttsville and Litwalton and an extended VA 354. In May 1950 (CTB), VA 3 east was truncated from Westland to end at VA 200 (now VA 3) White Stone, leaving behind SR 695. In March 1954 (CTB), VA 3 was rebuilt in the Comorn-King George CH area, leaving behind SR 677, abandoned alignment at VA 206; SR 678/610 at King George CH. In March 1955 (CTB), VA 3 was rerouted at Christchurch in Lancaster County to use modern VA 200, leaving behind SR 645 and an extended VA 222. In Oct 1956 (CTB), VA 3 was extended from White Stone over the Rappahannock River to VA 33 (replaced VA 200), then duplexed with VA 33, then replaced VA 225 south to VA 14, then duplexed with VA 14 to end at US 17 Gloucester C.H. In Sept 1957 (CTB), VA 3 was removed from SR 614 loop Emmerton; SR 692 loop Farnham. Sometime after 1958 (based on '58 county atlas...I can't find a CTB reference), VA 3 was split into one-way alignments through Fredericksburg. EB used the original route on William St. WB used Sophia St, Amelia St and Washington Ave. 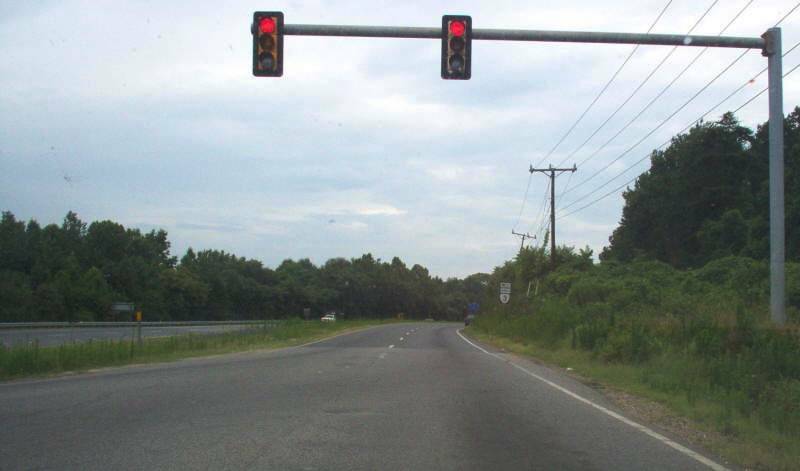 In March 1961 (CTB), VA 3 was removed from SR 686 west of US 301. In July 1963 (CTB), VA 3 was removed from SR 741 in Spotsylvania County. In Sept 1965 (CTB), VA 3 was removed from SR 761 at Popes Creek in Westmoreland County. In Sept 1973 (CTB), VA 3 was removed from SR 790 north of Kilmarnock. I believe in Aug 1976 (CTB), VA 3-33 was removed from the SR 707 loop in Grafton. In Feb 1985 (CTB), VA 3 and VA 200 swapped alignments between White Stone and Kilmarnock, giving VA 3 the more direct routing. In 1995, VA 3 was placed on its bypass of Fredericksburg, replacing the existing VA 3 CONN across the Rappahannock River and the rest as new construction. The old route through the city became VA 3 Business. 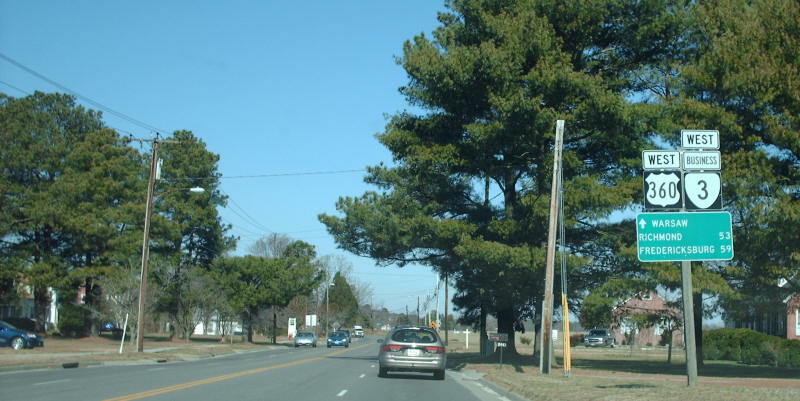 About 2000, VA 3 was given a newly constructed bypass of Lignum, leaving behind OSR 3 (now SR 788). In 2001, VA 3 was placed on its newly constructed bypass around Warsaw, leaving behind VA 3 Business. Improvements: Paved upon inception everywhere except the last few miles into West Virginia, which were not paved until after VA 3 was removed from this stretch of road. In 1941, VA 3 was multilaned across the Rappahannock River in Fredericksburg. In 1962, VA 3 was widened from Fredericksburg west to the I-95 proposed location. In 1964, VA 3 was multilaned from I-95 west to Chancellorsville. In 1972, VA 3 was widened from the Rappahannock River east to about where VA 3 Bus ends today. In 1974, VA 3 was multilaned from Chancellorsville to VA 20; Gloucester C.H. east 3 miles. In 1976, VA 3 was widened on its US 360 duplex. In 1981, VA 3 was widened further east in Stafford County. 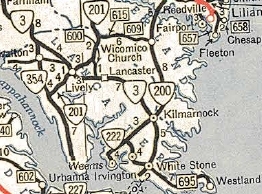 In 1983 or 1984, VA 3 was widened from VA 20 to VA 375; from Kilmarnock to the 1979 segment. In 1988, VA 3 was widened from VA 375 west to SR 620; east into King George County. In 1995, VA 3 was multilaned when placed on its Fredericksburg bypass. In 1995 or 1996, VA 3 was widened from US 360 east for several miles. In 1997 or 1998, VA 3 was widened from Montross to VA 202. 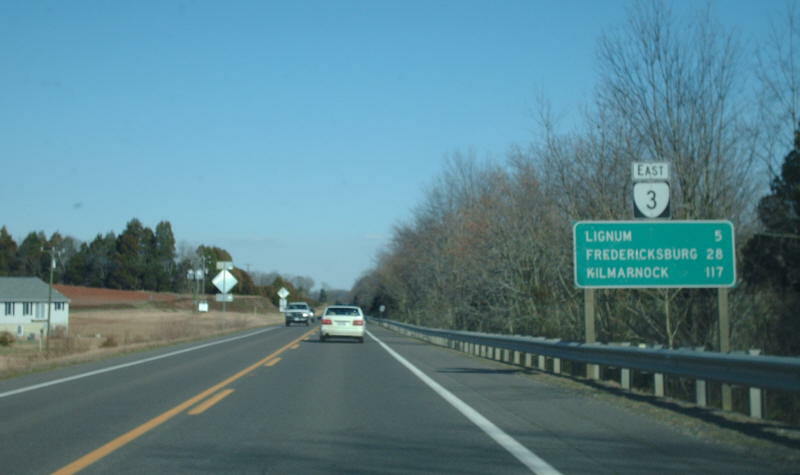 In 2000, VA 3 was multilaned on its new Lignum bypass. In 2001, VA 3 was multilaned on its new Warsaw bypass. In 2005, VA 3 was multilaned from US 15-29 to a mile east of US 522. In 2008, VA 3 was multilaned from the 2005 segment to Stevensburg. In 2017, VA 3 was multilaned from Stevensburg to Lignum, making VA 3 continuously multilane from US 15-29 Culpeper to VA 205 King George CH. VA 3 is still 2-lane through King George C.H. VA 3 is 6 lanes from I-95 west 4 miles. Posted: Fully posted; The last known cutouts in Culpeper were replaced about 2015. A couple cutouts on the Northern Neck lasted to about 2000. VA 3 is posted from both directions on US 29 Business in Culpeper as if VA 3 extended past US 15 Business. Comment: VA 3 is one Virginia's longer state routes, stretching from the Shenandoah Foothills to the lower Chesapeake region. VA 3 has been improved greatly from King George westward, but progress has been slow in the Northern Neck. Billboards in Westmoreland County used to ask "VA 3 Historyland Highway or Colonial Cowpath"
VA 3 initially began where today's US 220 enters Virginia from North Carolina then veered west using today's SR 686. VA 3 used today's US 220 Business through Ridgeway. VA 3 used today's SR 902 Mica Rd and SR 782 Old Sand Rd approaching Martinsville. VA 3 followed the general path of US 220 Business to the Smith River except it used Wilson Park Ln at the US 58 Bus Jct. VA 3 crossed the river just west of the current US 220 Bus SB bridge span. VA 3's original Martinsville routing is uncertain, as the earliest inset I have is from 1927, where the route is shown to use Bridge St to Starling Ave northeast to Church St west, then one-way splits using Walnut (NB) and Bridge St (SB), then Main St and JOnes St before exiting via Fayette St and today's VA 457 and VA 57. VA 3 followed VA 57 to modern US 220 and may have used today's SR 993 Reed Creek Rd. VA 3 appears to have followed more or less US 220 to the Rocky Mount area except it may have used SRs 755/619 loop. Approaching Rocky Mount, VA 3 used US 220 Business except SR 1020 and 1023 loops. It is unclear if VA 3 used 220 Business through Rocky Mount or if it veered west through the downtown area...by 1932 the route was today's 220 Business. North of Rocky Mount, VA 3 followed SR 919 to Boones Mill. VA 3 followed US 220 (aside from a couple abandoned loop alignments) up to the Blue Ridge Pkwy, then used SR 766 Stable Rd and SR 789 Old Rocky Mt Rd. Approaching Roanoke, VA 3 used US 220 Business into downtown, then followed Commonwealth Rd to Rutherford to 7th St to US 460 to 9th St north. It is unclear if VA 3 followed today's VA 115 to Lee Hwy or SR 601 further northeast. VA 3 picked up today's US 11 northeast of Roanoke; It used US 11 to Buchanan except it used the SR 1001 loop near SR 654; SR 721 in Troutville; Snuffler Rd loop; SR 715 north of I-81 Exit 162; SR 1312 James River Terrace near Buchanan. In Buchanan, VA 3 followed US 11 to VA 43 south, then used Bridge St north across the James River, picking up SR 1305 on the other side. VA 3 cut east on VA 43 back to current US 11 north. VA 3 followed US 11 north, then F-054 west of I-81. About where SR 608 crosses I-81, VA 3 began following F-055 (except an abandoned bridge north of SR 749) until it meets with US 11 at Exit 175. VA 3 used US 11, then SR 737 loop south of Natural Bridge. North of VA 130, VA 3 followed SR 743 Fanny Banger Rd across US 11 using Rices Hill Rd, then SR 686 Herring Hall Rd back to US 11 near Exit 180. VA 3 followed US 11 through Fancy Hill, Reservation Loop near SR 739, and more US 11 (there are some visible abandoned alignments through here). VA 3 used SR 764 over to VA 251, then used VA 251 and Thornhill Rd to meet US 11 Business. VA 3 used Main St through Lexington, then crossed the Maury River via covered bridge just west of the current US 11 crossing. VA 3 used SR 631 west to SR 681 north to (cut off by I-64) SR 750 across VA 39 to SR 645. VA 3 used SR 645 northeast to US 11 near Exit 191. 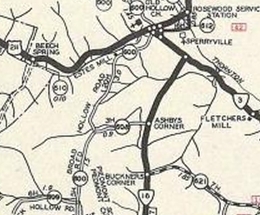 VA 3 used US 11, then SR 785/716 Timber Ridge loop; several abandoned alignments along US 11 through Fairfield and Steeles Tavern to Greenville. VA 3 used SR 1205 Main St through Greenville and may have used SR 613 Old Greenville Rd to Staunton. 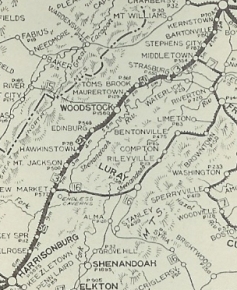 1922 Auto Trails maps incorrectly show VA 3 using VA 39-252 from the Lexington area to Staunton - the 1920 CTB Minutes clearly show VA 3 running through Fairfield. VA 3 used today's US 11 Business through Stauton, then followed US 11 to the West Virginia line except: Pickering Ln at Exit 257; Tollhouse Rd in Mauertown; In Winchester it is unclear whether VA 3 used Market or Braddock through downtown. With a route this old and with US 11 being improved to 3 and 4 lanes, there are innumerable abandoned alignments throughout. In 1923, VA 3 was renumbered as VA 33. 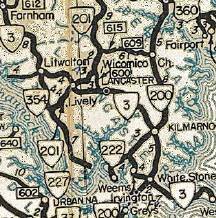 VA 3 ALT: Mentioned in CTB Minutes in the late 1940s as a new bypass of Litwalton in Lancaster County. However, when the road was completed and opened about 1950 it became mainline VA 3. VA 3 CONN: Appeared about 1986 as new construction, connecting US 17 Bus/VA 2 across the Rappahannock River to VA 3. About 1995, VA 3 CONN was extended west to US 1 Bus, then shortly thereafter to VA 3. At that point it became the VA 3 Bypass of Fredericksburg. I don't recall any VA 3 CONN postings, only "TO VA 3" or "To US 17"
VA 3 CONN has been on every state issue since 1986 right through 2010! VA 3Y #1? : Implied to have existed. It would have appeared in July 1933 as a renumbering of: VA 37Y running between US 211 and VA 3 (now US 522) in Sperryville. It is unclear when this may have gone away but it would've been by 1947 when VA 3 was decomissinoed this far north. Today it is SR 1001. It is also possible that VA 3Y was renumbered as mainline VA 3 between 1940-47. VA 3Y #2: Appeared in Oct 1956 (CTB) as a renumbering of VA 14Y, running in the north leg of a triangle at the US 17-VA 3/14 jct in Gloucester. It is unclear why this renumbering was necessary. It appears VA 3Y was physically destroyed when VA 3-14 was 4-laned in 1974. Creation: VA 3 Business through Fredericksburg appeared about 1995 when the bypass around the south side of downtown Fredericksburg was completed. Improvements: Paved upon inception; Only the westernmost 3/4 mile is 2-lanes. Posted: Fully posted although a few shields sans the Business banner exist in the City of Fredericksburg. Comment: VA 3 Business's one-way splits predates the Business designation. Creation: VA 3 Business through Warsaw appeared about 2001 when the bypass around the north side of Warsaw was completed. Comment: VA 3 Business is implied but not explicitly shown on Official maps.